I feel I owe readers of that review an update. How was virtual Pandora, you might wonder? Hey, I've been to that planet. You've only ogled it through 3D glasses. I, the Avatar gamer, have controlled an Avatar avatar. You, the Avatar moviegoer, have merely dreamed of that. Advantage me, yes? Press pause on your hopes and fears that games threaten to seize cinema's status of creative energy and accomplishment. Consider this a case of a game making movies look good. Avatar: The Video Game was going to be for me what marketers of movie-based games have always hoped their games would be for me. It would be my attempt to savor a blockbuster's aftertaste via a video game extension. I thought Ubisoft, often a publisher of very good games and maker of the pretty-good Peter Jackson King Kong game, could extend my stay in — and maybe even improve my experience of — the Avatar movie's lush world of Pandora. The game would be the fabled vacation-after-vacation, an experience I ought to have known is so fantastic that it would continue to be fantasy. The Ubisoft game had a few selling points. One, it would be beautiful, though game machines can't render the pseudo-realistic fantasy beauty of James Cameron's blockbuster. Not powerful enough, yet. There was 3D, too. The Xbox 360 version I would play was hyped to me in pre-release press demos I attended for being in 3D. I was given glasses at a Manhattan hotel last summer and watched the game. It's a third-person game. The player starts watching and controlling their human hero as he lands on Pandora and starts venturing into the jungle. With 3D glasses on, I could see added depth to the game's lush graphics. Ubisoft isn't a company that relies on tech gimmicks alone, though. And that's smart given that the choice to play Avatar in 3D requires a couple-thousand extra dollars spent on a 3D-compatible TV, rather than the couple of bucks extra it costs to opt to see the movie in 3D. 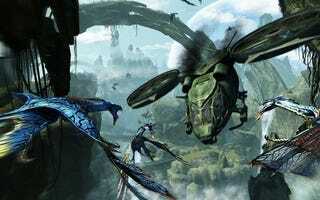 Beyond 3D, the Avatar game's hook was that, at some point, the player would be able to side with the humans, continuing the game as an increasingly heavily-armed commando or switch bodies and play on as a Na'vi, adventuring through with more of an acrobatic flair. Once I saw the Avatar movie, I understood why the Ubisoft creators had structured the game as they did. The game hero, Able Ryder, like the movie's hero, Jake Sully, is our everyman newly arrived on Pandora and soon to be thrilled by the transference of his consciousness into a tall blue cat-person. These strangers to this strange world would be perfect character to, blank as they were, abandon the eviler populations of humanity and sign up for nobler Na'vi living. In the movie, which has been accused of being as simplistic as it is gorgeous, Jake Sully decides he's just about done with humanity when he awakes from a post-coital slumber alongside his Na'vi girlfriend to find humanity about to literally bulldoze him, her and her forest. Playing Avatar the game in my house after seeing the movie — knowing that games have been getting better and better at trying and succeeding to allow the player to engage in some morally complex decision-making — I thought, hey, here's Avatar: The Game's chance to do one better than Avatar: The Movie. Here, unfortunately, I present to you Avatar: The Game's take on moral decision-making. We are a couple of hours into the game. We've mostly played in a human body but are in the midst of running around in an avatar physique. We have discovered the identity of a human-in-Na'vi-body traitor to humanity. We have just had a military helicopter show up and a commander hope out of the chopper. We have just had all of our movement controls taken away from us. We are stuck, standing and swiveling like a morally-conflicted gun turret (oh, is that the complexity of us as gamers?) and we have the commander and the Na'vi sympathizer, glowing icons over their heads, imploring us to choose. Shoot one. Video games, you had a shot to show how you can thrive by giving your audience the opportunity to flip the moral coin that movie audiences can merely watch some highly-paid actor flip in accordance with how the script told him to flip it. No. You gave us the morally-conflicted-gun-turret. Avatar: The Game actually plays okay. Plenty of people could buy it, play it and say they had fun. You run around and, as per your missions, shoot stuff, defend stuff and collect stuff in the jungles of Pandora, your enemies and tasks varying based on Which Side You Chose. Players could also notice that the bad-guy humans yell such un-Avatar things as "Time to pay the piper," "The bigger they are the harder they fall," and "You have no right to be here." In noticing that they might discern a gap between the quality of a not terribly-sophisticated Hollywood script and a video game script. The Avatar gamer might not notice, however, the signs of effort, the ever-interesting struggle of video game creators to execute great concepts and provide the interactive version of fundamental storytelling concepts. Some day, in other words, video games will do emotions and decisions and moral shades of gray as well or better than the movies. An early attempt: This game rewards the players points, when they're a human, for shooting Pandora's plants. Jake Sully doesn't do much plant-shooting in the movie, even when he's yet to have his post-coital ethical awakening. The game, however, by rewarding points for plants shot, both accepts the inevitability that gamers enjoy shooting anything in a game world (problematic to some, yes) and manages to make obvious the notion that, when you're playing as a human, hey, we don't mind you shooting the plants. Screw this planet, we encourage it. Thus, when you're playing as a Na'vi and you get no points for shooting or chopping up plants, the message is clear: Oh, shooting at plants is not so classy. A game can be designed to surmount virtual trigger-finger instincts and tell us such a thing. Outsiders may scoff, but trust that this is not easy. In fact, it is a fundamental challenge for game designers to convey any sort of moral scolding regarding antisocial behaviors, even the shooting of pretty plants. These are the early days of games conveying the heft of conscience. Avatar: The Game had other nice ideas in it too, besides the scoring/non-scoring of plant-shooting. It has a Risk-like metagame that allows players to strategize global conquest or defense while also playing the game as an on-the-ground (or in-the-trees) individual. It had the subtle distinction between player height, which, as silly as it sounds, makes a game world feel different if those characters you used to see at eye level are suddenly seen far down your nose, a head-height or two below. And it had this moral forked-road, which, well, see above. You could argue, stretching, that the game was built to attempt more things than the movie. Film tells a story and provides an escape, all experienced once-over. The game tried to do the same plus provide choice, allow us to explore a life lived various ways and to think globally of Pandora while playing locally. As with so many games, it sounds superb on paper and, as with so many video games, it sounds superior to what modern films do. But then you see the movie. Then you play the game. And, oh yeah, you realize the gulf. Criticize not ambition but execution. There has never* been a great video game based on a movie that came out when the movie did. The widely-hailed Best Movie Game, GoldenEye, followed its James Bond cinematic inspiration by two years. James Cameron's Avatar: The Game was made alongside the movie and beat the film to release by a couple of weeks. The game never managed charm and it came second-place in beauty. I stopped playing it after a few hours. I had chosen to support the Na'vi, obtained a flying beast and killed a lot of humans. The missions weren't that fun, though. So I stopped. I tried the Wii version. No moral choice there. Na'vi all the way and no improvement. I wanted the post-vacation-vacation from an Avatar video game. I got the theme-park attempt at a re-creation instead, simpler in some ways, more ambitious in its complexity in others. Movies won this round.